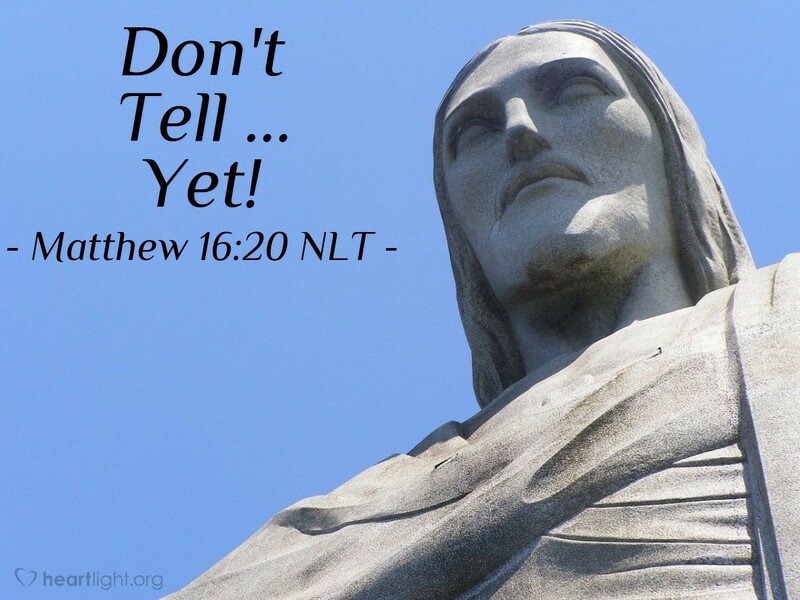 Then Jesus warned his followers not to tell anyone that he was the Christ. One of the biggest mysteries of the Gospels over the years is why Jesus did not want anyone to tell others who he was. Some suggest it was just a psychological ploy to get the people to do just the opposite. Others suggest that he wanted to reveal his identity himself and not have it distorted by well-meaning but ill-informed people. It seems to me that Jesus didn't want the people to go around saying who he is because this puts him in a mold, a category, a title, that the people of his day had pre-defined. Jesus wants to redefine the meaning of Son of God. He wants to re-wire the circuits of what people think that it means to be Christ, the Messiah of the Jews. So until he can live it and show it, he refuses to let others spread it. He will let his life, the cross, and his resurrection define his identity. Only then will he send his disciples out to tell the entire world who he is! There is something wonderfully essential about the cross and resurrection that helps us define Jesus' identity. Without them, we are not only misinformed, but we are also without a true Savior! Thank you, God, for having Jesus reveal his identity rather than having his disciples distort the true message of Jesus' identity. As Immanuel, God with us, I know Jesus' ministry was your ministry and Jesus was your presence. Please give me more strength and great power in talking to others about this so they can come to know Jesus as Lord, too! In Jesus' name I pray. Amen.